Four-wheelers, ATVs, UTVs, side-by-sides and more are so much fun! Some are used for work purposes such as around the farm or hunting, but many are used purely as a recreational vehicle for weekend fun! Regardless of how you use your ATV, you may want to consider an ATV insurance policy. We answer the most common questions that come up both in our office and around the country in the claims departments regarding ATV insurance. Doesn’t My Home Insurance Cover This? If your ATV is used only on your property and never off, then likely your home insurance policy will provide some coverage. It is always best to check with your insurance agent on how much coverage and what circumstances are or are not covered. ATV insurance is very inexpensive when compared to an auto insurance policy. In fact, it can be under a dollar a day. Talk to your insurance agent for a free insurance quote. Am I required to have it? Typically no. Just because you own an ATV doesn’t mean you need to have insurance on it. However, if you use your ATV on state lands, parks or other public areas, it would be incredibly unwise to operate your vehicle there and many state lands and parks will require riders to have the vehicle insured and licensed for use in the parks. The most common discount available would be a multi-policy discount for insuring other products with the same company. For instance, if your home and auto insurance is already with an insurance company, that same company may offer you a discount on your new product. My ATV Is customized, is there coverage for that? Custom parts and equipment can be added to most policies. Some policies will even include some customer parts and equipment into your base rate. 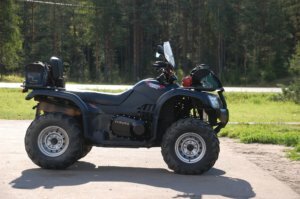 If your ATV is customized it is important to keep up to date documentation of custom parts in the event of a claim. If you’d like a quote on your ATV/UTV or side-by-side, give us a call. Our licensed staff can quickly and easily help you decide what coverage and options are right for your situation. Should I Have Collision & Comprehensive Insurance on My Auto Policy?